It looks like everything is ready to go! Is everyone ready? It's time to open the doors. The doors open and the sale begins! We had a great turn out for our sale last year! Flo, Carol and Jeannine busily selling baked goods. 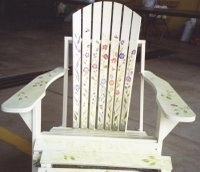 Two of last year's raffle items - a handpainted adirondack chair and ottoman and mosaic garden stepping stones. A huge thank-you to Club members Pam Naples for painting the chair and ottoman and Coleen Guest for making the stepping stones. 2007's Children's Education and Activity Corner. The topic was "Beneficial Insects and How to Attract Them to Your Garden". Mayfest is our Club's annual plant sale, bake sale, raffle and flea market that raises the money that we donate each year to charities that benefit the community. The majority of the plants that we sell are dug right from Club member's gardens! Club members, long time gardeners themselves and quite a few of who are Penn State Master Gardeners, are on hand that day to assist buyers with their plant selections. The last several years we have added a Children's Education and Activity Corner. In 2007, the program taught children (and everyone else) about beneficial insects and what type of plants to grow to attract them to your garden. The children's activity was making a caterpillar from an egg carton and planting it with the seeds of a plant that would attract beneficial insects to their garden. The focus of this year's Children's Education and Activity Corner will be recycling and learning how to become a "Planet Protector"!